Some have found Abinadi’s use of a disguise rather puzzling, seeing that he sought to conceal his identity while at the same time openly preaching among the people.1 It’s possible that the disguise was merely used to gain entrance to the city, and that after he was among the people it was no longer needed.2 Yet when this story is compared to biblical stories which also deal with prophetic messengers, kings, and disguises,3 it seems that there is likely more to Abinadi’s disguise than initially meets the eye. These stories typically depict a contest or conflict between God and an earthly king. As Alan Goff has noted, “All of the kings or their heirs in the biblical disguise stories meet with brutal deaths, and in each case the dynasty fails.”6 The same outcome befell King Noah, who was burned to death by his own people and whose dynasty ended after the reign of his son (Mosiah 19:20). As for the disguise itself, it’s notable that right before it is mentioned in the text, the narrator reported that the “eyes of the people were blinded” (Mosiah 11:29).7 This suggests that the disguise typifies the inability of wicked people to discern between truth and error.8 King Noah himself arrogantly asked, “Who is Abinadi, that I and my people should be judged of him, or who is the Lord, that shall bring upon my people such great affliction?” (Mosiah 11:27). Although Noah’s question was surely meant to be rhetorical, it ironically demonstrates his personal lack of spiritual perception. He could discern neither the Lord nor his prophetic servant. The symbolism of the veil—and its connection to a disguise—may be especially significant. It’s possible that King Noah and his people didn’t initially identify Abinadi as the man who had previously preached among them. Even after the people apprehended Abinadi, they repeatedly referred to him as “a man” or “this man” or, in the words of King Noah, as a “fellow” who was “mad.”12 The record never once mentions that they recognized him. Centuries earlier, Isaiah prophesied that the Lord had poured out a “spirit of deep sleep, and hath closed your eyes: the prophets and your rulers, the seers hath he covered” (Isaiah 29:10). By using a disguise to literally cover or obscure his identity, Abinadi symbolically demonstrated the spiritual blindness of the people—especially their inability to recognize a true prophet.14 They may have outwardly accepted Moses and the laws that he revealed, but as Abinadi declared, “I perceive that they are not written in your hearts” (Mosiah 13:11). When it came to the things of God, they were spiritually asleep. In some ways, Abinadi’s disguise may also be symbolic of Jesus Christ and His earthly ministry.16 To King Noah and his priests, Abinadi quoted prophecies that the Messiah Himself would be unrecognizable to His people because He would appear as an ordinary man. He would have “no form nor comeliness” or “beauty that we should desire him” (Mosiah 14:2; cf. Isaiah 53:2). Instead, he would be “despised” because the people “esteemed him not” (v. 3).17 As recorded in the gospel of John, Jesus Christ “was in the world, and the world was made by him, and the world knew him not” (John 1:10, emphasis added). Similarly, Abinadi “came among [the people] in disguise, that they knew him not” (Mosiah 12:1, emphasis added). Alan Goff, “Abinadi's Disguise and the Fate of King Noah,” Insights 20, no. 12 (2000): 2. 1. See Matthew Roper, “Abinadi: Master of Disguise (Howlers #3),” at Ether’s Cave: A Place for Book of Mormon Research, June 13, 2013, online at etherscave.blogspot.com. 2. The story of Samuel preaching from the city wall is another example where a prophet had to find an unusual way to gain access to the people in order to preach his message (see Helaman 13:2–4). 3. These stories include the following narratives: (1) King Saul disguising himself in order to receive guidance from the witch of Endor (1 Samuel 28), (2) a prophet disguising himself in order to condemn King Ahab for not executing a Syrian King (1 Kings 20), (3) an Israelite king disguising himself to avoid harm in battle, only to be slain by an archer (1 Kings 22), (4) Josiah disguising himself in order to meet with an Egyptian Pharaoh (2 Chronicles 35; 2 Kings 23), and (5) Jeroboam’s wife disguising herself to visit a blind prophet concerning her son’s illness (1 Kings 14). For detailed summaries of each of these stories, see Richard Coggins, “On Kings and Disguises,” Journal for the Study of the Old Testament 50 (1991): 56–59; Alan Goff, “Uncritical Theory and Thin Description: The Resistance to History,” Review of Books on the Book of Mormon 7, no. 1 (1995): 194–196. 4. Coggins, “On Kings and Disguises,” 55. 5. Coggins, “On Kings and Disguises,” 55. 6. Alan Goff, “Abinadi's Disguise and the Fate of King Noah,” Insights 20, no. 12 (2000): 2. 7. For an analysis of the source documents and narrative layers of this story, see John W. Welch, The Legal Cases in the Book of Mormon (Provo, UT: BYU Press and the Neal A. Maxwell Institute for Religious Scholarship, 2008), 140–145. 8. See Goff, “Abinadi's Disguise and the Fate of King Noah,” 2 for further discussion of symbolic blindness. 10. See Book of Mormon Central, “Did Abinadi Prophesy During Pentecost? (Mosiah 13:5),” KnoWhy 90 (May 2, 2016). 11. For more on the use of veils in the Bible and the ancient Near East, see Stephen D. Ricks and Shirley S. Ricks, “‘With Her Gauzy Veil before Her Face’: The Veiling of Women in Antiquity,” in Bountiful Harvest: Essays in Honor of S. Kent Brown, ed. Andrew S. Skinner, D. Morgan Davis, Carl W. Griffin (Provo, UT: Neal A. Maxwell Institute for Religious Scholarship, 2011), 347–352. 12. See Mosiah 11:9, 13–14; 13:1. 13. 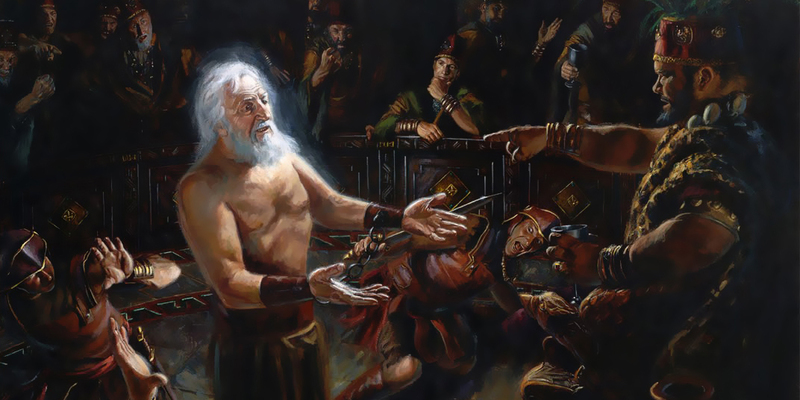 See Book of Mormon Central, “Why Was Abinadi Scourged with Faggots? (Mosiah 17:13),” KnoWhy, 96 (May 10, 2016); Welch, Legal Cases, 201–205. 14. Although the specific details of Abinadi’s disguise are absent from this narrative, it’s possible that he used ashes to cover his face. In the Old Testament, ashes were often connected with mourning or destruction (see Jeremiah 6:26; 25:34), and using ashes to obscure identity was a method of disguise used by a prophet in 1 Kings 20:38–41. Considering that Abinadi was prophesying of impending calamities and destruction, it would be symbolically appropriate for him to have used ashes as part of his own disguise. 15. Taylor Halverson, “Mosiah 12–16. Martyr in Disguise,” The Interpreter Foundation, May 11, 2016, online at mormoninterpreter.com. 16. Jesus was the great Jehovah of the Old Testament, the “God of Israel, and the God of the whole earth” (3 Nephi 11:14), and yet He condescended to dwell among men in a tabernacle of flesh (Doctrine and Covenants 93:4). In a sense, then, his mortal body itself can be seen as a disguise or covering for His divine nature. 17. See Book of Mormon Central, “Why Did Abinadi Talk about the Suffering Messiah? (Mosiah 14:4),” KnoWhy 91 (May 3, 2016). 18. Hugh Nibley, The World and the Prophets, The Collected Works of Hugh Nibley, Volume 3 (Salt Lake City and Provo, UT: Deseret Book and FARMS, 1987), 7. 19. See Boyd K. Packer, “The Twelve,” Ensign, May 2008, online at lds.org. 20. See David A. Bednar, “‘Chosen to Bear Testimony of My Name,’” Ensign, November 2015, 129, online at lds.org: “These ordinary men have undergone a most extraordinary developmental process that has sharpened their vision, informed their insight, engendered love for people from all nations and circumstances, and affirmed the reality of the Restoration.” See also, Boyd K. Packer, “The Mantle Is Far, Far Greater Than the Intellect,” BYU Studies 21, no. 3 (1981): 1–18. 21. For the imperative to awaken oneself to the glorious truths of the Restoration, see Dieter F. Uchtdorf, “Are You Sleeping through the Restoration?” Ensign, May 2014, 59, online at lds.org. 22. Thomas S. Monson, “Dare to Stand Alone,” Ensign, November 2011, 60–67, online at lds.org. See also, Carol F. McConkie, “Live according to the Words of the Prophets,” Ensign, November 2014, 77–79, online at lds.org.